Pablo Picasso was the first true rockstar of the art world. He influenced, not just painting and sculpture, but fashion, architecture and design, as well. Born in Malaga, Spain in 1881, Picasso took the family name of his mother, which he perceived as being more exciting than his father’s more common surname, Ruiz. His official birth name was Pablo Diego José Francisco de Paula Juan Nepomuceno María de los Remedios Cipriano de la Santísima Trinidad Ruiz y Picasso. His father, Don Jose Ruiz, was an artist and art teacher, who recognized and encouraged his son’s artistic talent at a very early age. Picasso had two younger sisters, Lola and Conchita. Conchita died of diphtheria when she was seven. 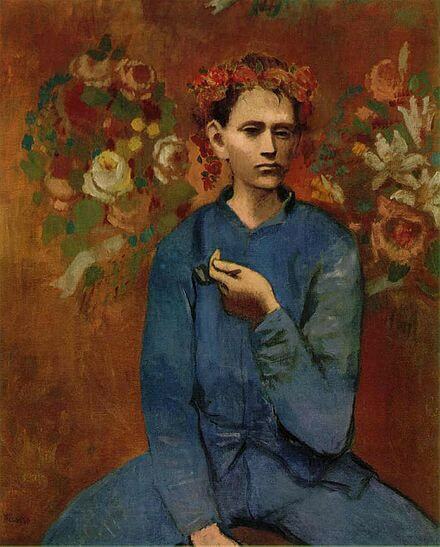 Picasso was thirteen at the time of her death. 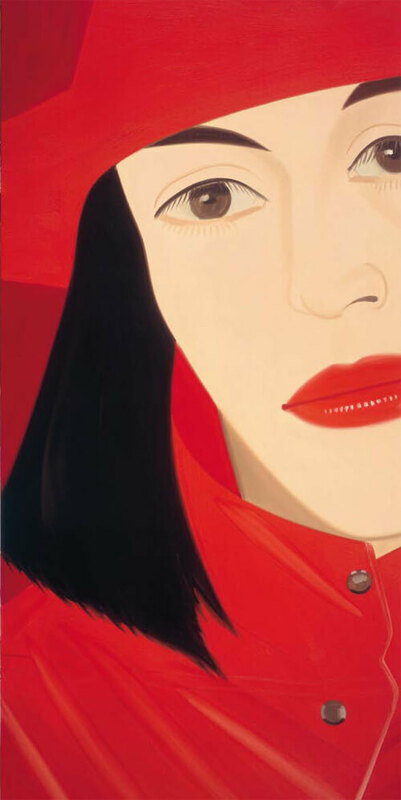 After her death, the family moved to Barcelona, where Ruiz taught at the School of Fine Arts. Ruiz convinced school officials to let Picasso take the entrance exam for advanced classes at age 13. Picasso was admitted but lacked the discipline as a student in a structured environment. His father sent him to the prestigious Real Academia de Bellas Artes de San Fernando in Madrid, hoping it would be a more challenging environment for Picasso, but there, too, Picasso was bored, stopped going to class and studied on his own. In 1900, at the age of 19, Picasso moved to Paris with his friend, Carlos Casagemas, an art student and poet. Casagemas fell in love with a young woman named Germaine Pichot, but the feelings were not reciprocal. Casagemas said that he would return to Barcelona and invited his friends to a farewell dinner. At the end of the dinner, Casagemas pulled out a gun, shot and wounded Germaine and then turned the gun on himself. The first bullet only grazed Germaine’s neck, but the second killed Casagemas. The death of his friend led to The Blue Period (1901-1904) with blue the predominant color of each painting, depicting feelings of sorrow, including La Vie and other posthumous paintings of Casagemas. The Blue Period was follow by The Rose Period (1904-1906), where both the themes and colors of his work were more mellow and serene. Boy With a Pipe, painted in 1905, sold in 2004 for $104 million. The Rose Period paintings brought Picasso to the attention of art dealers in Paris, and he began to experience commercial success. Between 1904 and 1906, Picasso’s work returned to more traditional themes, although his style remained strongly his own. In 1906, at the Louvre, Picasso saw an exhibition of sculptures of Iberian heads that changed his paradigm about painting. 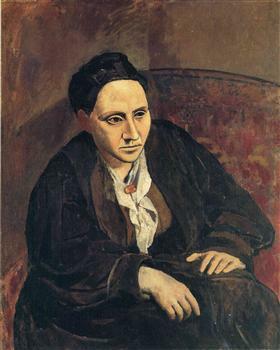 A 1906 portrait of Gertrude Stein, a long time patron, reflects an early shift in his style. It was an exhibit of African masks that led Picasso to paint Les Demoiselles d’Avignon in 1907, a raw look at women in a brothel, a far cry from the polite and civil way they had been painted in the past. 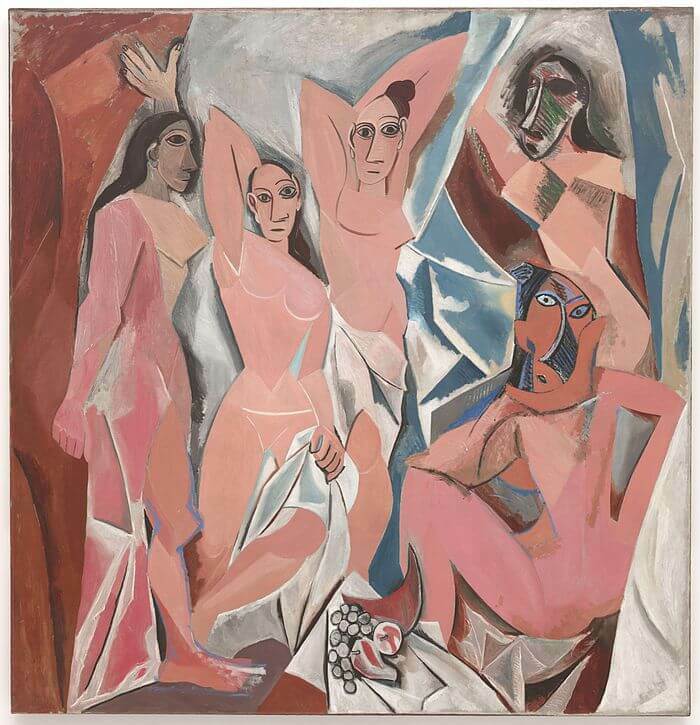 Les Demoiselles d’Avignon was unlike any painting that had come before and changed the art of Picasso and the modern world. His cubist paintings were not well received but Picasso continued to refine his style. Georges Braque painted in a similar style during this time and the two artists formed a bond. Their cubist style, with its fragmented and deconstructed forms, showing multiple viewpoints and just the essence of a figure or structure, opened the door to abstract art. Matisse, who was both a friend and rival of Picasso’s, harshly criticized his cubist works. Despite criticism, the works sold well. Picasso’s work continued to be innovate, emotional and influential. He transformed sculpture by using every day objects in collage. In 1937 Picasso painted Geurnica, which is considered by many to be the most important painting of the twentieth century. Picasso remained in Paris, while his home country of Spain was being torn apart by civil war. In April of 1937 a squadron of German Aircraft, supporting Spanish fascists, dropped over 5000 bombs on the town of Guernica, which was being held by the communist opposition. More than 1600 civilians were killed. It was the first time that Europe had experienced such a terrible tragedy. Picasso painted Guernica in response to the destruction. 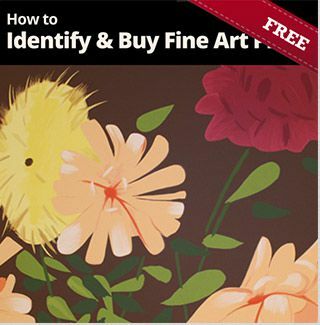 The painting is more than 11 feet high and 25 feet wide. Guernica was exhibited at the 1937 World’s Fair in Paris and then at other venues around the world. The touring exhibition was used to raise funds for Spanish war relief. 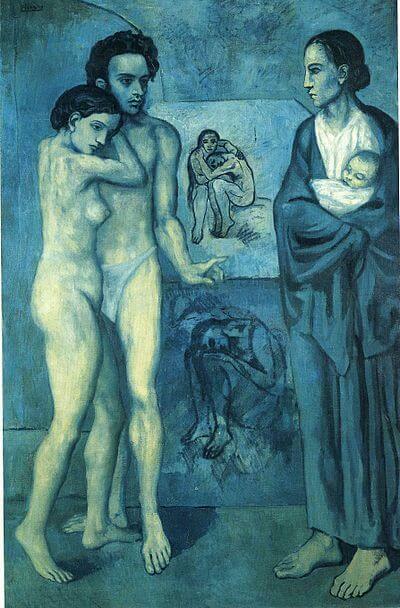 Picasso was married twice. He had four children by three women and was notorious for his affairs, especially those with women much younger than himself. Picasso traveled extensively throughout his life, but made France his home. He applied for French citizenship in 1940, but was refused because of his vocal praise of communism. 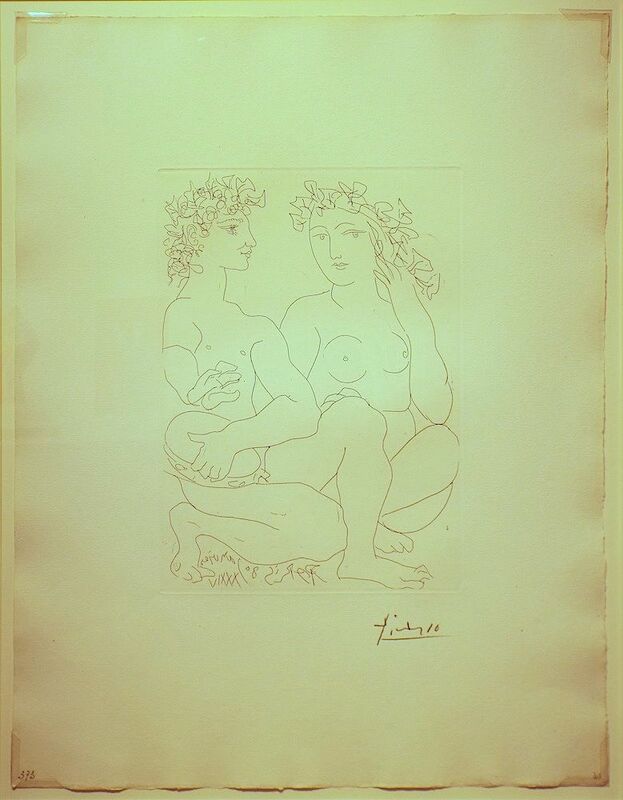 Picasso died in his home in Mougins, France, in 1973, during a dinner party given by him and his wife, Jacqueline. 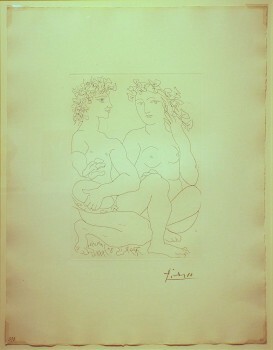 Many of his works are housed in the Musée Picasso in Paris and the Museo Picasso Málaga in Spain. 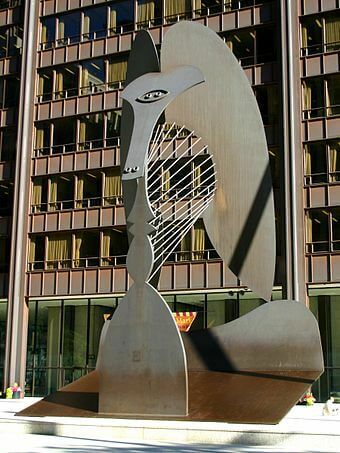 In 1967, Picasso was commissioned to design a sculpture for the Daley Loop in Chicago. The sculpture is fondly referred to as The Chicago Picasso. He was offered $100,000 for the sculpture, but refused the money and gifted it to the city. Picasso created more than 43,000 works of art. His sense of style and creativity made him a superstar, his name synonymous with great art. 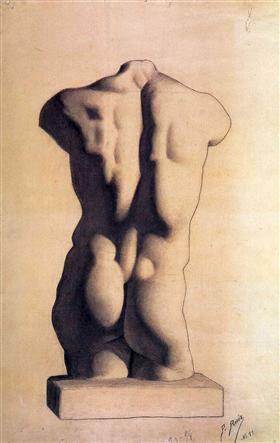 Pablo Picasso Study of Plaster Male Torso done 1893 when Picasso was twelve years old.